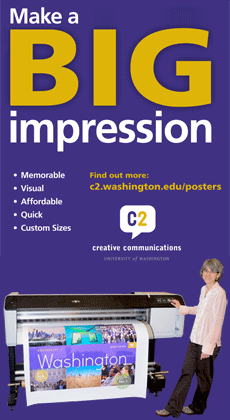 Creative Communications offers a number of ways to get material printed. Large format – posters, banners, wall clings, and floor graphics. We can help you find the best production method for each of your projects. Contact your Account Manager. If you are creating the print ready file for your project, please review our Print-Ready Guidelines (PDF). We can provide proofs for any type of printing done and recommend that you build in time for a round of proofing, particularly if the piece is in color and/or has photos. Proofing is your opportunity to catch problems before all the material is printed. In addition to printing, we provide all finishing services, including trimming, binding, scoring, folding, laminating, and much more. Your Account Manager is here to help you achieve your communication goals. They will work with you to define your project objectives and ensure that your project stays on time and on budget. To get started: Find your Account Manager now.